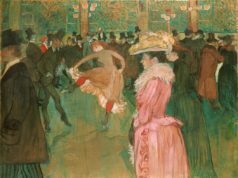 My favorite little Paris museum has undergone a metamorphosis! 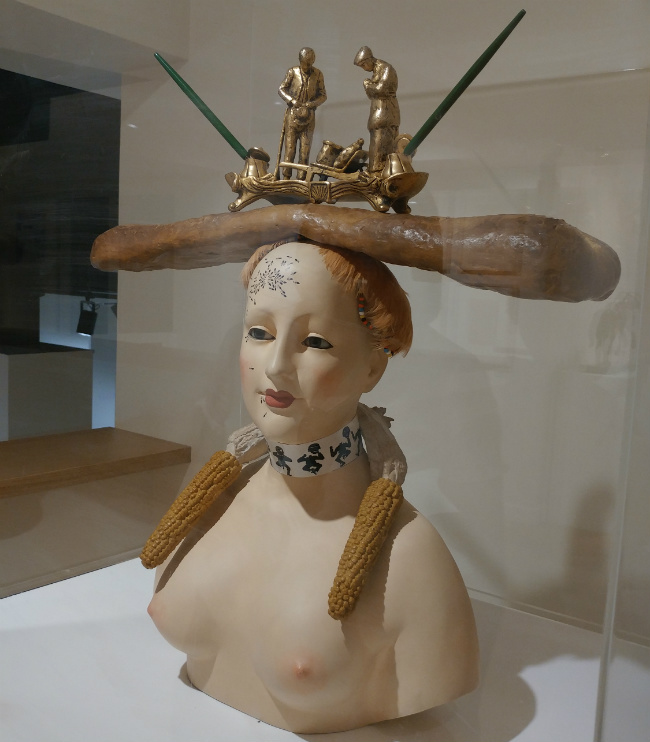 The experience of walking through an intimate and uncrowded museum space full of Salvador Dali’s most spectacular art is a special treat I save for myself to savor every year or two. I have adored the Dali Museum (now apparently called Dali Paris instead of Espace Dali) since I accidentally ran into it a few years ago. Where else can you be surrounded by a sculptural world that lets your inner child breathe in the stuff of dreams? 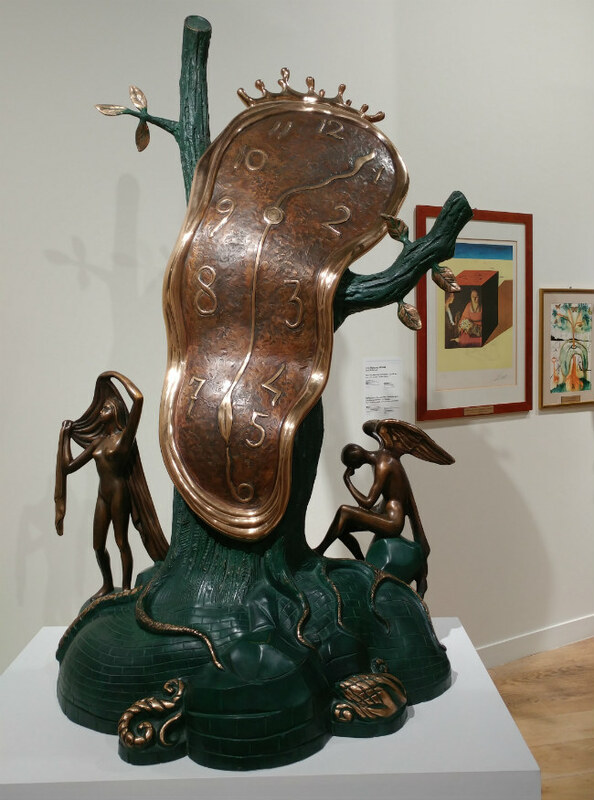 A clock leaning on a dark green branch and melting away to depict the world’s impermanence (from Dalí’s dream of runny Camembert); a woman on fire with opening and closing drawers in her torso – said to be the secrets of love; an elephant bearing on his back a heavy orange obelisk, above dangerously long, spindly legs (“of desire”) depicting both weightlessness and strength; Alice in Wonderland with head and hands of roses, holding a rope aloft; the lips of Mae West as a bright red couch. I remember that first day of discovery. I had planned to escape the crowds and cameras and semi talented artists on Place du Tertre at the top of Montmarte. I wanted to head down the hill into the narrow streets once trod by the likes of Picasso and Utrillo – and this time I did not go past Maison Catherine and take the overcrowded rue Norvins but instead headed left from rue Norvins straight across the Place du Tertre, then turned right at the corner into the Place du Calvaire and passed the outdoor patio of Chez Plumeau – a restaurant that I now think of as an oasis since it appears to be a quiet place for a drink though just around the corner from the crush on Place du Tertre. 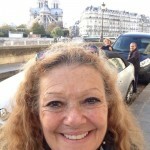 Down a couple of steps from the Chez Plumeau patio and I found myself on a quiet plaza at the beginning of rue Poulbot, a red brick street with what appeared to be a small residential building on my right on which I spotted a large photograph of Salvador Dali’s face. 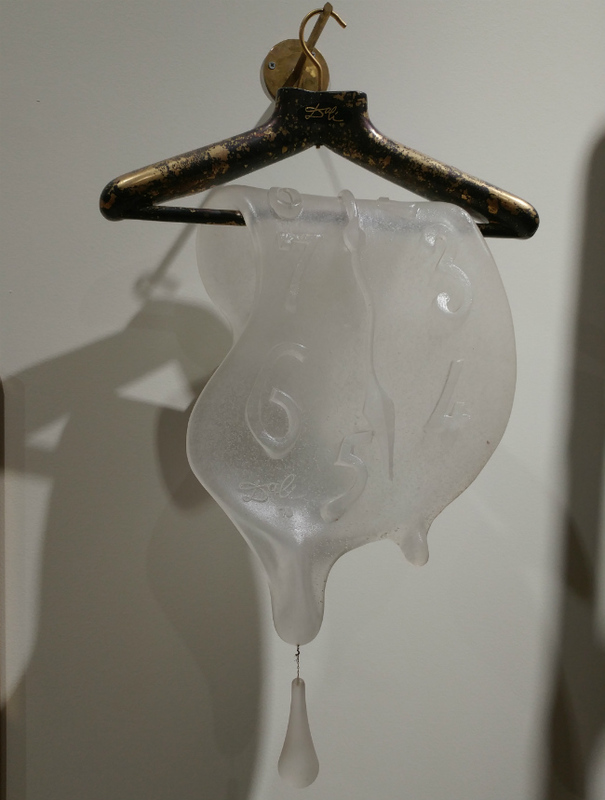 I wandered through the door, paid an entrance fee, walked down to the lower level, and fell in love – surrounded by a wonderment of Dali sculptures and lithographs and furniture– all displayed in a small, uncrowded and welcoming venue that holds over 300 Dali works. But my biggest surprise was what I found during my most recent visit just a few months ago. Entering the museum, I discovered that Espace Dali had closed for four months in early 2018 and reopened in April– reborn and reinvented. As I passed the ticket takers and started down the stairs into what had always been the entirety of the museum, I discovered a small additional level just to my left with a number of surprises, including a video introducing me to Benjamino Levi, the Italian art dealer and surrealist expert whose Galleria Levi in Milan had introduced to Italy such artists as Magritte, Piccasso and Dali during the 1960s. Thereafter he founded the “Dali Universe” to curate Dali works from his vast personal collection, and, in 1991 (two years after Dali’s death), Espace Dali. 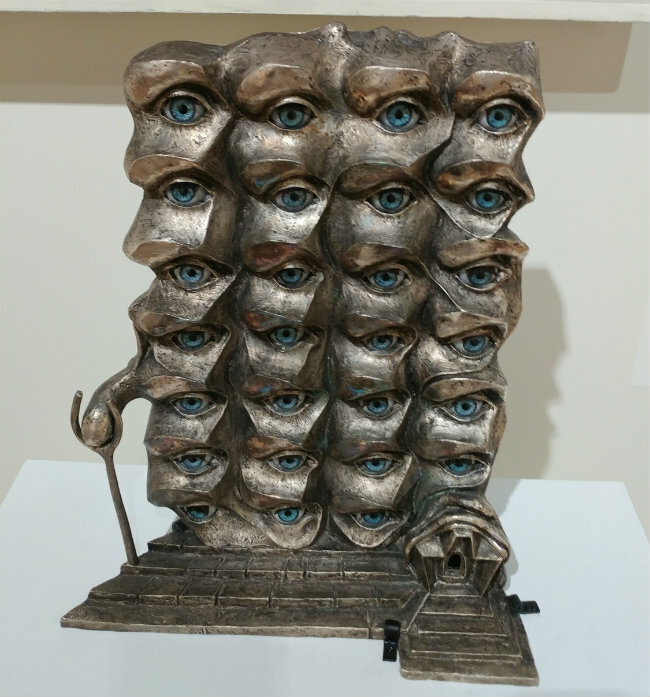 Today the museum remains the only place in France where a large volume of Dali works are on permanent exhibit – particularly the artist’s most spectacular sculptures. 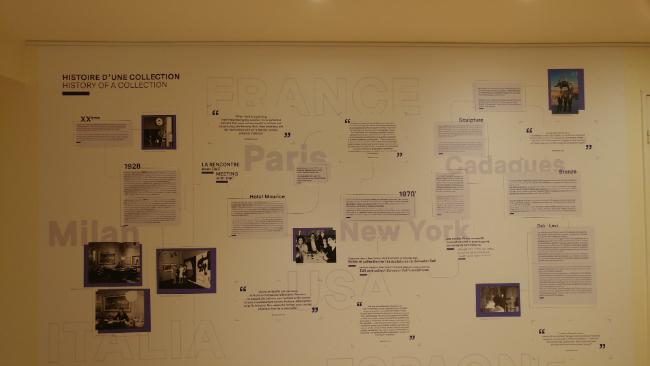 The new room also features a chronological wall chart with the history of the collection, following the details of the Levi relationship with Dali over many years, including their important meeting in the early 1970s at the Hotel Meurice and subsequent meetings in New York and Spain and culminating with Levi becoming a muse of sorts to Dali. 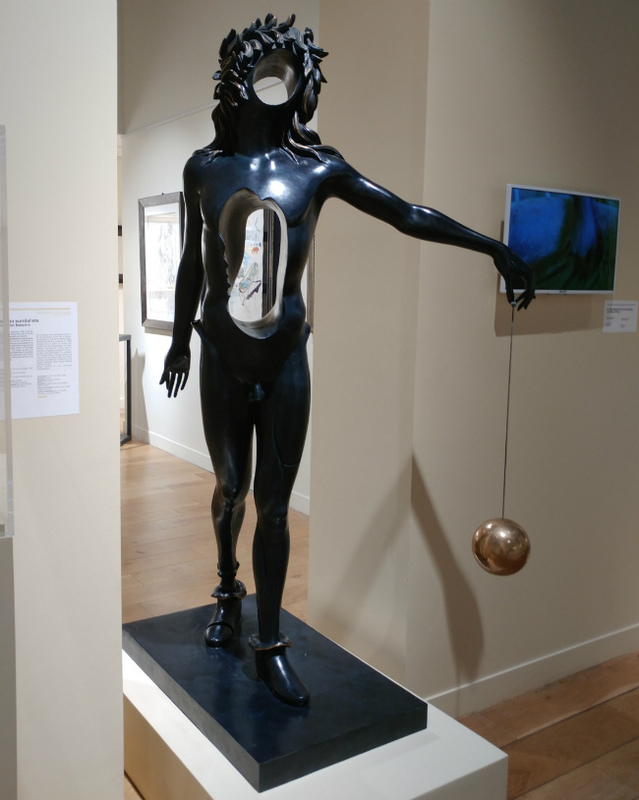 He spread the word throughout the art world about Dali’s sculptural works and helped Dali to recreate his paintings and prints as sculptures by commissioning bronzes. 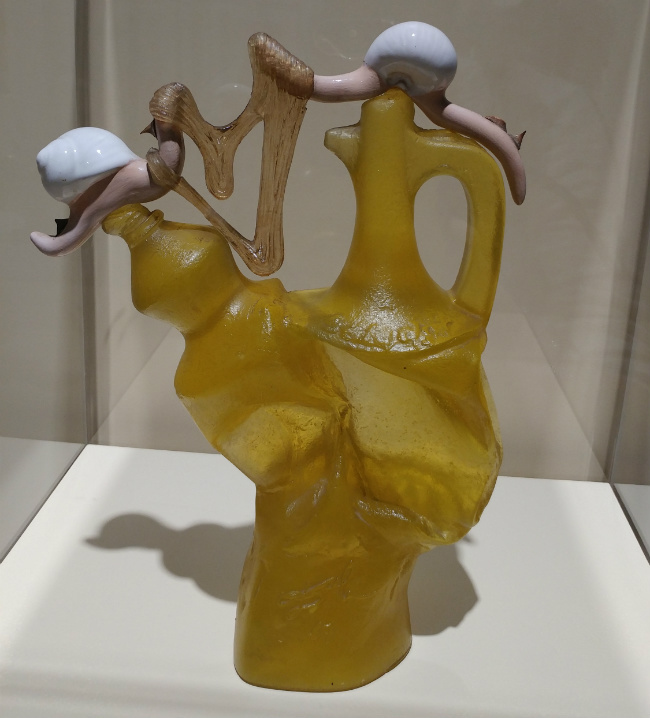 Some of the information about the Levi-Dali relationship is fascinating – including how bronze sculptural works (apparently considered a “poor relative” to the art world until well into the 1980s) were created from the Dali paintings and lithographs and marketed through their collaboration. (Notably, terrorism caused Levi to close his Milan gallery in 1974.) His descriptions of Dali’s personality and their conversations are also truly magical. Levi also gained the rights to many of the sculptural works – including the right to make authenticated copies to sell – and there is detailed information about how various versions of lithographic and sculptural works are recreated and copies made and authenticated. Until now, I had not seen information in the museum about the linkage to the Universe or to Mr. Levi. Now that information is shown via video and splashed across the walls. The extensive renovation last year also architecturally restructured and restaged the space under architect Adeline Rispal so that the central walls spin around a pillar and the sculptures and other works and their background information are placed so as to “highlight a part of his work that is less known but puts an essential light” on Dali’s “technique and creativity”– to quote the official museum website. Yes, the works with which I am familiar are still there. Space Elephant still supports his heavy orange obelisk on those long spindly “legs of desire”; the woman in Buste de Femme Retrospectif still supports a bronze inkwell on her head above a sculpted loaf of bread (originally edible until eaten by Picasso’s pooch); several sculpted clocks melt away to depict impermanence; a celestial rhinoceros; Newton with all of the holes in his body; and both the sculpture of Alice in Wonderland and lithographs from the book. But there are also numerous works and videos that I have not seen there before, along with a very different method of display that forced me to spend extra time to read all of the new information and watch the videos and take in the rich learning experience now presented to the visitor. For example, a video describes in fascinating detail the so-called “lost wax” method of creating bronzes – the method used in foundries to create such artworks. 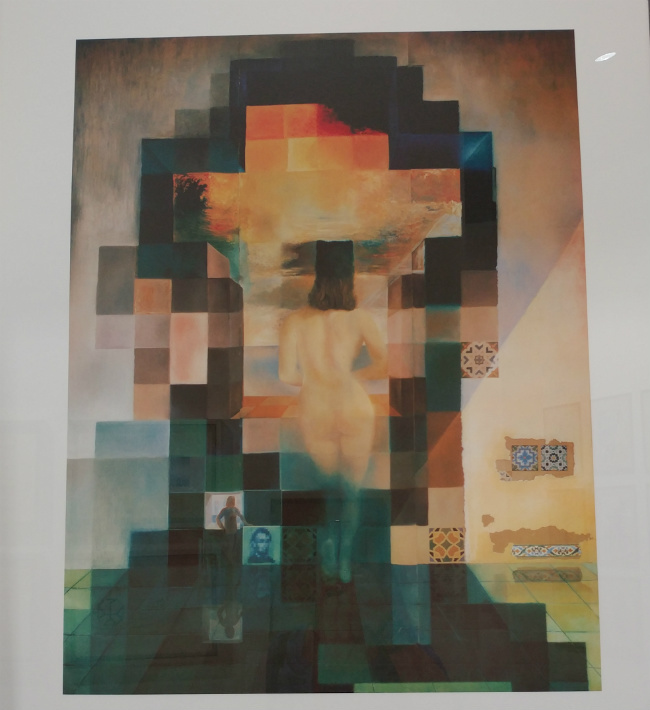 And the information on wall posters is much more extensive and inclusive, pulling together groupings to explain such things as Dali’s thoughts on reality, or on eroticism. Some new artworks have been installed. I loved seeing for the first time the yellow “L’Important C’est La Rose” sculpture inspired by two yellow plastic oil bottles found on the beach with snails placed on them to drip slime, and “Malebranche’s Fish” seeming to represent a dolphin balancing on its tail balancing a ball on its nose, the idea taken from philosopher Nicolas Malebranche’s mortuary monument. 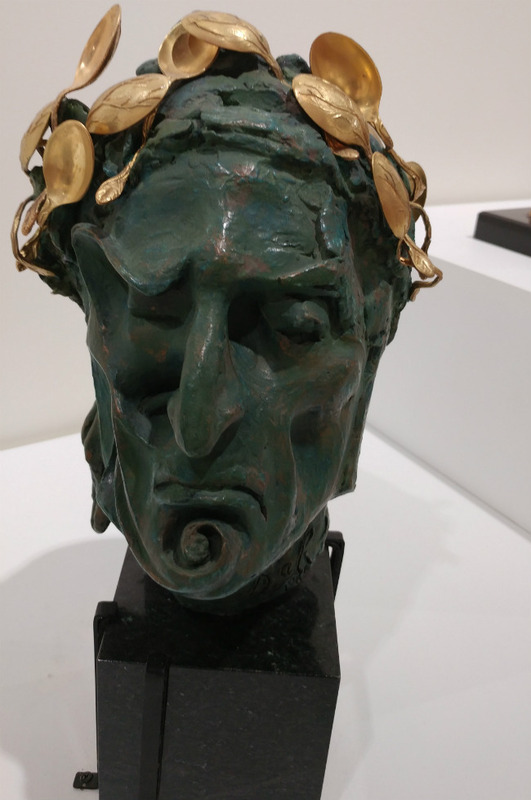 Also – Dante’s bust, a collaborative sculpture where Christine Forani created the basic sculpture and Dali added such things as gold spoons crowning the head, and a circuit board beneath. The surprises go on and on. On the wall of one room is a listing, with definitions, of the Dalinian icons and symbols. There’s now a screen on which you can watch the animated film Destino done by Walt Disney Studios in collaboration with Dali– which I first saw at a major Dali exhibit at the Pompidou in 2013. Walt and Salvador were indeed an unlikely couple but the cartoon really works, as the typical Disney idealized woman finds her beautiful prince only after fighting Dali creatures, whereupon our hero turns from stone sculpture into human form. (Though the storyboards by Dali and Disney cartoonist John Hench were made between 1945 and 1946, the film was not completed and shown to the public until its 2003 New York release). The museum’s now sleek website has been broadened to provide more information, including the larger picture of Dali and his works and the founding of the museum by Benjamino Levi, the existence of his “Dali Universe” (the flagship Paris museum is only but a part of this). Before this facelift, I have to say that the website was limited, and didn’t provide much current information about new exhibits. Now, it is integrated into the expansive “Dali Universe” website. 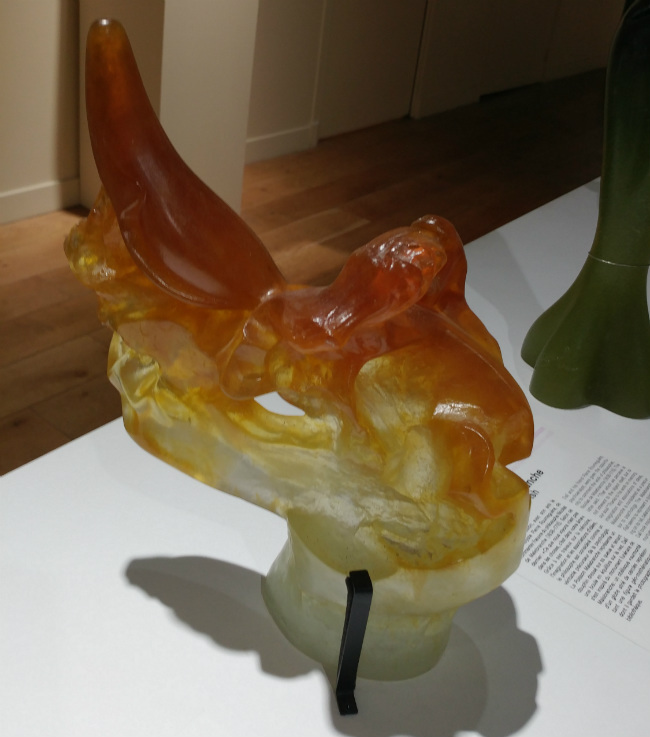 At the same time, the website is now more commercial since it emphasizes the purchase by the general public of Dali sculptures through the gallery at the museum and various international exhibitions. Previously, the museum had a somewhat small sales gallery on the lower level, and also a gift shop selling books and posters and jewelry at street level. The gift shop is no more – that was to me a disappointment- having been replaced by a second sales gallery of artworks, and the website is clear that those purchase locations exist. 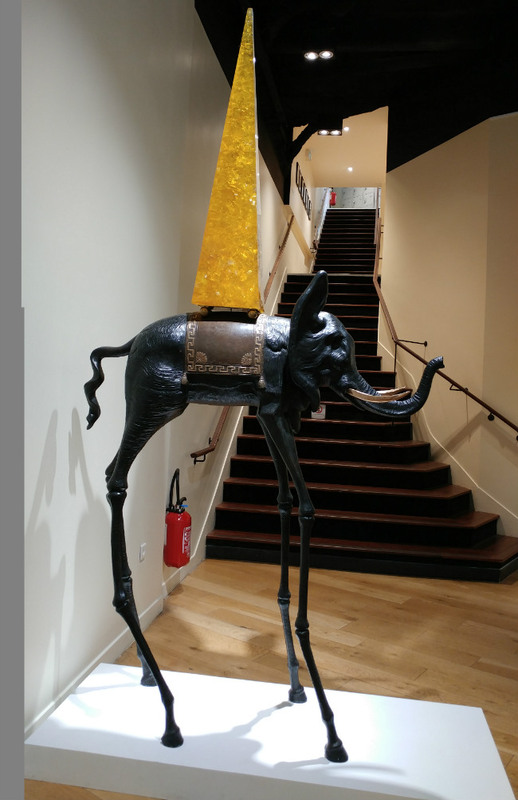 Few tourists or locals seem to be aware of this sparkling gem of a museum almost hidden on a quiet little street– a museum that is home to the largest collection of Salvador Dali artworks in France – and now has had a major facelift. To me it’s still one of the most exciting places to visit in Paris. 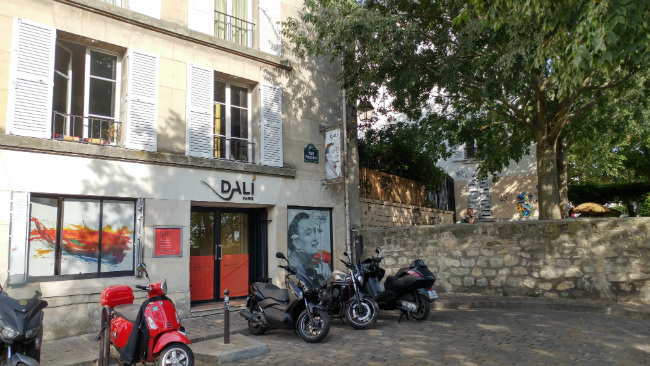 Dali Paris, 11 rue Poulbot, 18th. Tel: +33 (0)1 42 64 40 10.